Our own rubber stamps are deeply etched red rubber and only available unmounted. You can purchase EZ Mount Cling Foam to create cling-mounted stamps (that temporarily stick to clear acrylic blocks without any extra adhesive). Here are instructions on how to use unmounted rubber stamps, including various mounting methods. 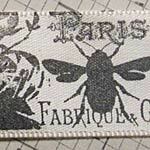 Do you remember the French Floral Overlays Collage Sheet (part of the Springtime in Paris Kit)? Well... guess what?! There are now not one, but TWO ATC-sized rubber stamps revamped from images on that collage sheet! Both of the new collaged stamps are just a bit larger than an ATC (so you can stamp a full bleed off the edges of your ATC). This one is landscape orientation and (of course) includes some BEES! 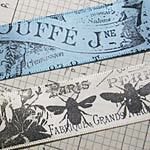 Stamped Ribbons by Design Team Member Rhonda Secrist Thomas. For more information see Rhonda's Stamping on Ribbons Tutorial in the blog.